I am reposting this today to honor both of the men below. Paul Arato passed away this week in Toronto, Canada and his memorial service is today. Carrol Walsh, his liberator, died in Dec. at his home in Florida and his memorial service was last Friday in New York. Paul and Rona would also check in annually for dinner with the Walsh family when they passed through our town. The last time I saw both of them together was in 2011 at one of these dinners in a local restaurant. They sat together and laughed and joked like old pals. Paul told the story of how he arrived in Detroit after the war as an eager late teen anxious to find work designing fast cars in the automobile industry and was driven to the bridge in Canada by law enforcement and pointed to the bridge to Canada, as he did not have the proper documentation. Picturing the scene in his mind, Carrol would laughed outloud and slapped his knee. Both men were so happy to have found each other. The Holocaust survivor was 6 on that spring day in 1945 when he last saw the U.S. Army soldiers outside Magdeburg, Germany. Paul Arato was among 2,500 starving and sickly Jewish prisoners from the Bergen-Belsen concentration camp, their train abandoned by its crew and Nazi guards as Allied forces advanced. Two U.S. Army tanks on a scouting patrol — one of them commanded by Carrol Walsh, then 24 — came upon the stopped boxcars. Arato, now 71, and Walsh, 88, met again this week. “Please give me a hug. 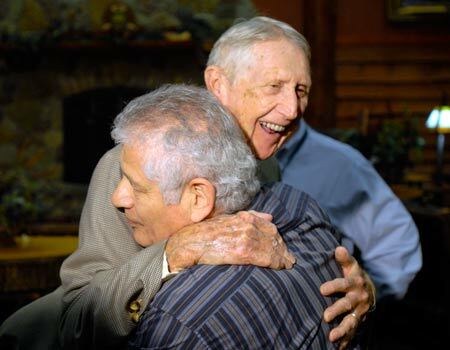 You saved my life,” Arato told Walsh in an emotional reunion of concentration camp survivors and some of the veterans of the 30th Infantry Division who liberated them. Arato, an industrial designer from Toronto, and Walsh, a retired state Supreme Court judge from Hudson Falls, came together for a Hudson Falls High School history symposium inspired by history teacher Matthew Rozell’s original World War II project in 2007. Those arriving early for Wednesday’s opening session gathered Tuesday night for an impromptu reunion before having dinner surrounded by the faux Adirondack decor of the nearly deserted indoor water park. Four of the five Nazi train survivors at the dinner had never met Walsh. Walsh’s tank patrol discovered the desperate Bergen-Belsen survivors on April 13 — hundreds of emaciated Jewish prisoners who had been herded aboard one of three trains leaving the camp a week earlier to keep them from being liberated by advancing Allied forces. Walsh’s patrol stayed for a time, handing out candy to some of the children, then moved on after reporting their discovery. Frank Towers, a 27-year-old first lieutenant in the 30th Division, led a convoy that took the newly liberated prisoners to a German town where they were given food and shelter. For weeks, the men of the 30th had heard of Nazi atrocities against Jews and dismissed the stories as propaganda, Towers said. That all changed when they encountered the train. “Then we believed,” said Towers, 93, of Brooker, Fla. This week’s reunion is the fourth since 2007, when Walsh was joined by three of the train survivors at Hudson Falls High. History teacher Rozell’s World War II project included an Internet posting of Walsh’s account of the train liberation. An Associated Press report of that first reunion prompted more survivors to come forward, some from as far away as Israel, Rozell said. In all, he has confirmed that more than 60 survivors are still living and has been in contact with about two dozen of them. Nine survivors of the Nazi death train are participating in this symposium, along with Walsh, Towers and four other veterans of the 30th who fought in Germany. Rozell said this week’s gathering is likely to be the last such event of its scope, given the advanced ages of the veterans and survivors. For Arato, Tuesday night’s reunion with Walsh brought back a flood of memories. He recalled getting candy from one of the soldiers and a handgun to play with. Arato fretted over one detail. He recalled seeing a Jeep along with the American tanks, but fellow survivor Fred Spiegel of Howell, N.J., didn’t remember seeing a third vehicle. Later, Walsh said his patrol consisted of two tanks — and a Jeep.